. . .The Major and she are living as happily as birds, in an absurd villa, and the former has taken to smoking. Otherwise he is unchanged—except, perhaps, there are moments when, alert and full of feminine unselfishness as the Major is by nature, he falls into a trance of abstraction. Then his wife recognizes with a concealed smile, by the blind look in his blue eyes, that he is wondering what were the title-deeds, and why he was not allowed to mention jackals. But, like so many old soldiers, Brown is religious, and believes that he will realize the rest of those purple adventures in a better world. Basil Grant and I were talking one day in what is perhaps the most perfect place for talking on earth—the top of a tolerably deserted tramcar. To talk on the top of a hill is superb, but to talk on the top of a flying hill is a fairy tale. Chesterton's book is a series of mystery stories involving a narrator and his friend, the eccentric ex-judge Basil Grant. 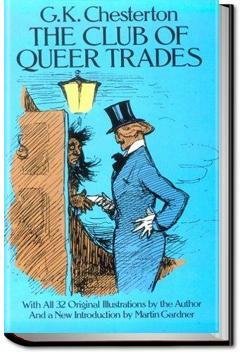 Each story is about someone who belongs to the Club of Queer Trades--someone who makes his living in an unique way. Se penso che stavo quasi per rimuoverlo dalla lista dei to-read per fare spazio ad altri titoli mi prenderei a righellate le mani da sola. Chesterton è geniale e geniale è il suo personaggio Basil, uno Sherlock Holmes molto più sociale di quello vero. Originale e divertente, si è rivelato un libro da leggere senza troppe pretese. E magari trovarvi qualche idea per un lavoro. Inventarsi dei mestieri stravaganti (ma anche remunerativi ed insoliti) può sempre tornar utile, no? A collection of little charm-like stories that combine to make a lovely bracelet of a book.